Lung transplant is a frightening and overwhelming experience for patients. Thoroughly understanding the process is one of the keys to a successful transplant and recovery. This pre-transplant guide will walk you patients through what to expect during this challenging time. Having both pre and post-transplant educational materials will help your both your Transplant Team and your patients. Why Are Lung Transplants Needed? What Kind of Transplants Can Be Considered? Can You Be Considered for Lung Transplantation? How Will Your Transplant Candidacy Be Evaluated? 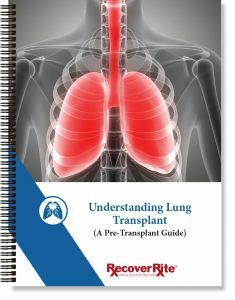 What Will Happen When You Are Accepted Into a Lung Transplant Program? How Will You Get Your Donor Lung?